I confess to being a bit of a gadget tragic. Some (ok, more than some) have been consigned to the useless kitchen items drawer, but not this one. As it write this it is a 40 degree C day in Melbourne and I have spent my time hiding inside, making and eating several of these this morning. It is pretty low-tech really. 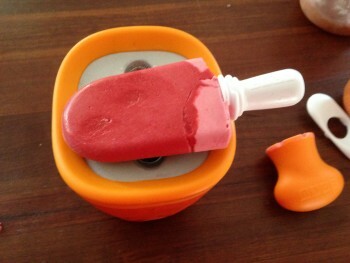 It uses the same principle as any freezable icecream maker, but without the complications of electricity, paddles, stirring and possible failures. Failures, sigh I have had several – I consider my icecream maker to be one of those aforementioned useless kitchen items. Anyway back to successes. You store the maker in the freezer to keep it frozen. Then when you feel like an icecream, just puree anything you like and put in the gadget on the benchtop. Seven minutes later, you have some heaven on a stick. You can make 3 before it runs out of oomph. I’ve been playing with it and making a few wonderful tasting things. 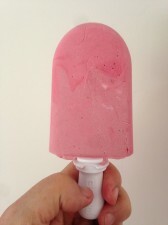 Watermelon, frozen raspberries, coconut milk, banana, apples, oranges, chocolate, hard cider! Not all together obviously. You can make them without any sugar but I find that they are better if you add a little bit as it stops any ice crystals forming and they are a smoother texture. Here are a few photos of using various combinations of frozen raspberries, frozen bananas and coconut yoghurt that I made today. They really are yummy, you get to decide what ingredients you want, AND there is the added factor of almost instant gratification. Next stop might be a chocolate and orange mousse icecream. Wow, that is one cool gadget! I’m an ice-cream tragic (three tubs of homemade in the freezer right now and one in the making.. sigh) and this would be awesome for making all the flavours in single servings. Yum. Where did you buy it? I got it online at Everten Lana. You can also buy them in Australia from most good homeware stores. I bought one a few years ago, but mine will do 3 at a time, so only Mummy or Daddy have to wait. It opened up a whole new thing of gadgetry for me. I did have an issue with mine 9 months after purchase. I contacted Zuko and they replaced the whole unit and were really amazing about the whole thing! I love mine Kathy. I can decide I want ice cream and have it very quickly and in whatever flavour I feel like! Got one for my birthday and for my first foray I tried coconut milk + mango + sugar = yum! Next time will add some banana too.